Our esports conference proved that the competitive gaming community benefits when industry veterans, CEO's, pro players, content creators, journalists, investors and more gather together for a day of authentic esports networking. We hosted over 20 panels led by people that work in esports every day and our goal of creating authentic conversations around the most pressing topics of the year was achieved. IGEC 2018 was our first ever esports conference and we were thrilled at the positive reception. To everyone who attended or participated in any way, we thank you dearly! ▲ Thanks for the memories! But, before any panel will take place, the entire conference will gather in one hall to hear the keynote speech for IGEC 2019. Last year, our Keynote speech was delivered by Kim Phan, Director of Global Esports at Blizzard Entertainment. "Our tribal knowledge is invaluable, so share as much as you can. My hope is that you will leave this conference with a renewed sense of purpose. To find a place in the esports ecosystem that you can help grow and be proud of. " Now, we are very excited to announce the next keynote speaker for IGEC 2019. 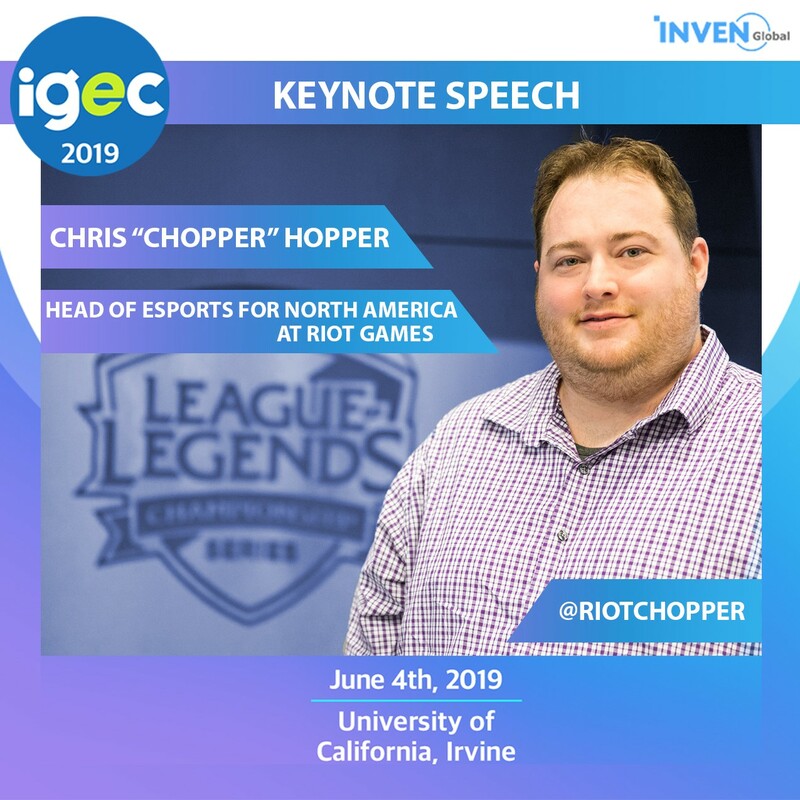 Chris "Chopper" Hopper, Head of Esports for North America at Riot Games. As Head of Esports for North America, Chris Hopper oversees the operation of the League of Legends Championship Series (LCS), the premier league for the world’s most popular esport in the United States and Canada. Under his leadership the LCS incorporated a franchise model, creating long-term partnerships with esports stalwarts such as TSM, Cloud9, and Team Liquid as well as traditional sports teams such as the Golden State Warriors, the Cleveland Cavaliers, and Houston Rockets. During his tenure, the LCS attracted sponsors like Dell Alienware, State Farm, & Jersey Mike’s and saw the average starting salary for players rise above $320,000. Additionally, Chris works alongside the College League of Legends team to advise on its development in North America which currently sees the participation of 300 colleges & universities. “It’s been an incredible journey over these last six years as Riot has developed League of Legends into a global sport. I’m excited to continue to build on the groundbreaking progress we’ve made in esports history - the NA LCS was one of the first leagues to require contracts and offer a guaranteed minimum salary and is also one of the first to franchise teams and offer significant revenue-sharing for pro players,” said Chris Hopper. “I’ve spent years building this league from the ground up, and am energized by the tremendous responsibility I feel to continue the successes we’ve achieved,” he added. Prior to his position as the Head of Esports for North America, Chris Hopper worked on the central Riot Games esports team that first launched League of Legends as an international esport around the world. During this period, the League of Legends esports ecosystem grew to 14 regional leagues, over 113 professional teams, 860 full time players and sold out multiple iconic arenas, including New York’s Madison Square Garden, the Los Angeles’ Staples Center and the Beijing National Stadium (also known as the Bird’s Nest). Reserve your badge today on our Eventbrite page and get ready to join the conversation. 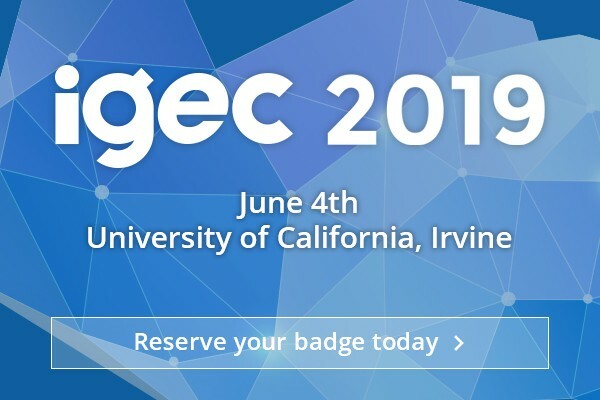 IGEC 2019 will feature over 25 panels and cover the most pressing issues facing the esports industry. Panel access (and IGEC goodie bag), free lunch and beverage catering are only available to standard and VIP ticket holders. Only VIP Ticket holders get access to our conference lounge, special sponsor gifts, exclusive IGEC giveaways, on-stage pitch opportunities, and our networking party once the conference concludes. Standard and VIP tickets sales are now available to purchase. Discounts are available for group purchases, so grab some friends or colleagues for a day of esports insights! 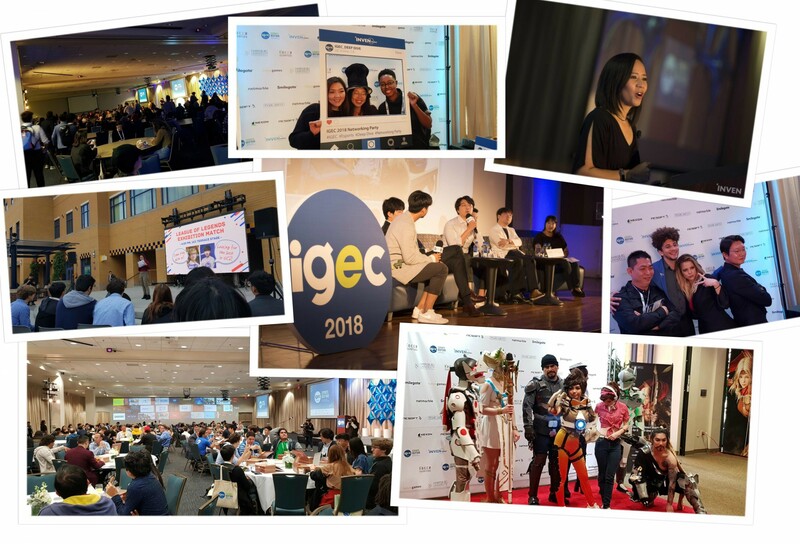 ● Cosplay events, LAN tourneys, winner stays fighting game stations, developer booths, esports apparel pop-up shops, and community panels are just some of the cool things happening at IGEC 2019 available FOR FREE -- everyone is invited! If you are interested in covering our event as media, please visit the following link and fill out our form. We will get back to you before the event to approve or deny media badge requests. Subscribe to our newsletter to get the latest IGEC 2019 news right to your inbox.